There was a tie in the winter photo competion at the Russian Blues Lounge. 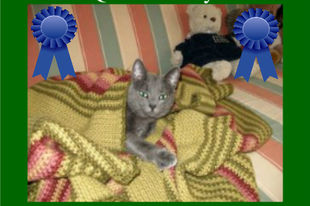 I am co-winner next to my furiend Sterling. See what a beautiful picture I received. I am so furry happy. We are two kitties living and ruling over Missylandia. We have a happy, comfortable life.